You are here: Home / HVAC Info & Articles / Articles / Why is My Furnace Leaking? Uh oh. There’s water puddled around your furnace. You’re thinking, “This can’t be good.” There are a few possible causes for a leaky furnace from normal wear and tear to faulty installation. Some of the causes can be easily repaired. Others may mean you need a new furnace. Before you worry too much or start Googling new furnace installation in Greensboro, NC, consider the possible reasons for the leak. Condensation. If the water is from condensation, the first question to ask is whether you have a high-efficiency furnace (90% or higher AFUE—Annual Fuel Efficiency Ratio). The easiest way to tell is that HE furnaces typically have a white PVC pipe for ventilation. High-efficiency furnaces do produce condensation due to their cool exhaust feature. That moisture is typically drained out unless the drainage tube is blocked or leaking. A standard efficiency furnace (with a metal exhaust pipe) would only have condensation if the flue pipe is the wrong size due to faulty installation. Furnace humidifier issues. If the internal furnace humidifier isn’t working properly it can cause condensation to form. Moisture inside your furnace can cause damage, so it’s important that this be repaired as soon as possible. Internal drain clog. Has your air conditioner been running? Does it share a drain system with your furnace? If so, it could be condensation from your air conditioner. An internal drain blockage could cause water from your AC to back up into your furnace. Faulty secondary heat exchanger. This is the big one, the problem that could result in whole furnace replacement. If the water is not due to condensation, it could be coming from the secondary heat exchanger. This is a significant part and it may not be worthwhile or possible to repair it without a furnace replacement in Greensboro, NC. If you see moisture around or under your furnace, the best thing to do is call a professional HVAC service. 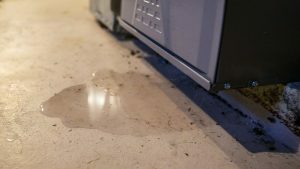 Whether the water is from condensation that is not properly draining or from a problem with an internal part, the situation should not be ignored. Letting a moisture problem go on too long can cause significant damage to your furnace or to your home. Excessive moisture in your home can lead to mold and mildew growth that can permanently damage your home and aggravate allergy sufferers. Too much moisture in your furnace can do irreparable damage to the system itself, resulting in the need for replacement. At the first sign of a problem, especially when excess water appears where it shouldn’t, it’s best to contact your heating and cooling company. Your expert technician will thoroughly inspect your furnace, locate the problem, and repair it if possible. If replacement is necessary, you won’t find a more reliable company to do your furnace installation in Greensboro, NC. Call Berico at (336) 273-8663.
https://www.berico.com/wp-content/uploads/2018/12/header-logo-new-3a.png 0 0 Berico https://www.berico.com/wp-content/uploads/2018/12/header-logo-new-3a.png Berico2017-09-08 16:51:472017-09-08 16:51:47Why is My Furnace Leaking?